How To Ice The Cookies: 1. Outlining – Using a #3 piping tip (or squeeze bottle), outline your cookie with royal icing. I like using a larger piping tip to outline and fill in larger areas, as the ‘flooding’ goes faster. 2. Flooding – Fill in the center of your cookie with the same piping bag and icing, either right away to help the icing melt into each other, or 10 minutes later if you’d like to see a distinct outline. I use the same icing to outline and fill in, as it saves time. Here’s a video if you’d like to see how. 3. Shaking – Shake gently to help smooth icing over. A couple of tips – You need to be gentle with the cookie while you’re shaking it, so that it doesn’t break, and working quickly is important so that the base doesn’t start to dry. 4. Wet on Wet Technique; The 2nd Layer – Using a #6 piping tip and white icing, pipe a circle close to the perimeter of your cookie and a dot in the center. (You can use a smaller piping tip here, it’s a personal preference. I liked the look of a thicker white line). 5. Marbling – Drag a toothpick through the wet icing, starting from the outside and working your way to the center of the cookie. If you think of your cookie as a clock, I dragged the icing at 12 o’clock, 3 o’clock, 6 o’clock and 9 o’clock, so that the circle was split into four quarters, and then split those sections in half. If you’re particular about every line being perfectly white, with no little dabs of color, wipe your toothpick between each drag. Working quickly is important as the royal icing starts to set almost immediately. For a video on how to marble cookies, click here. 6. Shaking – Shake gently to help smooth icing over. 7. Drying – Let your icing dry for 12-24 hours. And if you’d like to add some seeds, pipe a small white dot of icing, with a little yellow on top, and slightly drag a toothpick through it, towards the center of the cookie. 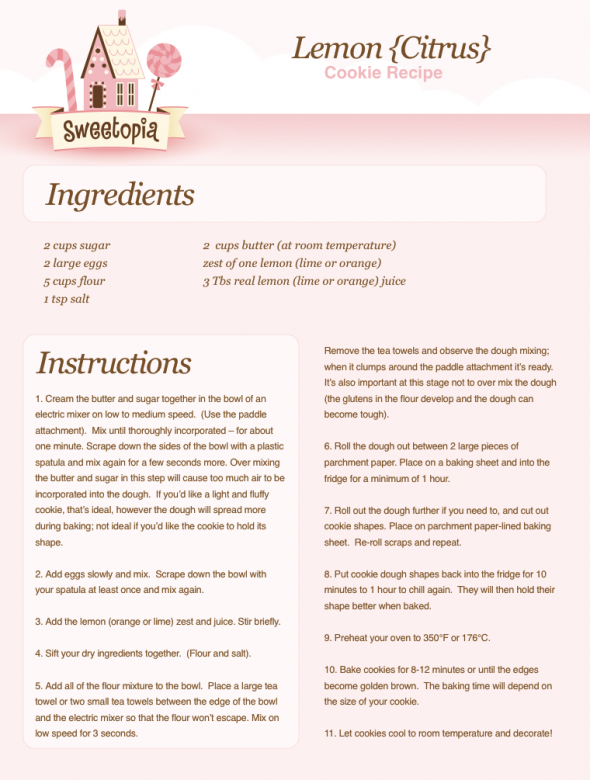 This entry was posted in All Things Baking, Cookie Recipes & Ideas, Instructions & How-To's, Recipes & Tips, Spring Baking, Summer Fun Baking and tagged citrus cookies, cookie decorating, spring cookies, summer cookies, sweetopia by Fancy Flours. Bookmark the permalink. These are lovely and perfect for thinking ahead to summer. The tutorial was very helpful!